It’s a GSD / kitten sandwich… Greetings GSROC. Just wanted to check in and say hello !!! As you can see the kids are doing great. Aspen is heading toward 14 yrs old and slowing down, but still is a very happy boy (although a little camera shy in this pic) And Sam is still a monster but he’s our monster and we love him to pieces. We lost our 22 yr old kitty to old age a few months ago. 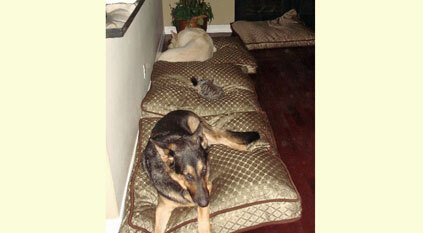 If you look closely at the dog bed in the middle you will see our new addition to the zoo. She’s a little kitten from the local shelter, her name is Jesse and we adore her. Anyway, thank you so much for all you do !! !